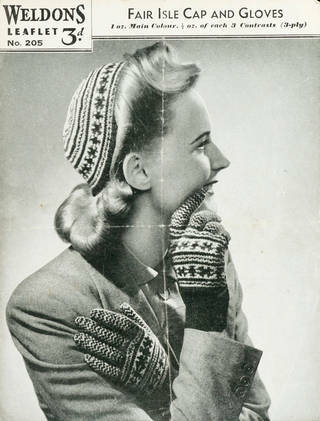 Hand-knitting was at a peak in Britain in the 1940s. 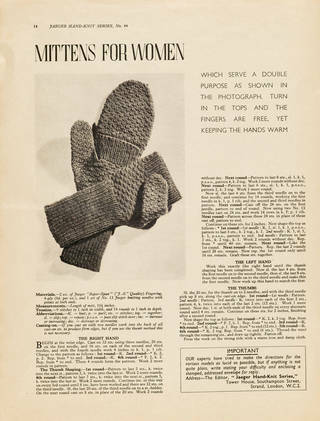 During the Second World War, women on the home front were encouraged to contribute to the war effort by knitting for the troops, which was promoted as public duty. 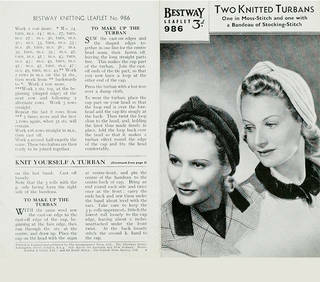 Advertising at the time stated: "England expects – knit your bit". 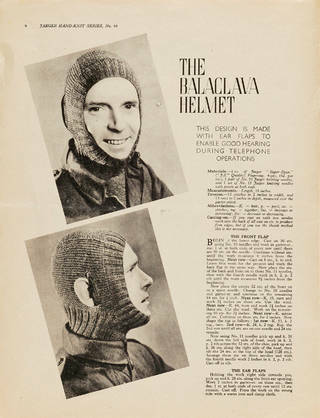 Many knitting patterns were given away free, while wool was also sent to schools so that children could knit gloves, scarves and balaclava helmets for the forces. Wool was also supplied to organisations such as the Women's Institutes of England and Wales, who made over 22 million knitted garments for the Red Cross (an average of 67 garments per member). Parcels of their knitwear were sent to prisoners of war, as well as to troops. The warmth of woollen garments also made them popular for civilians who were faced with a shortage of heating fuel. 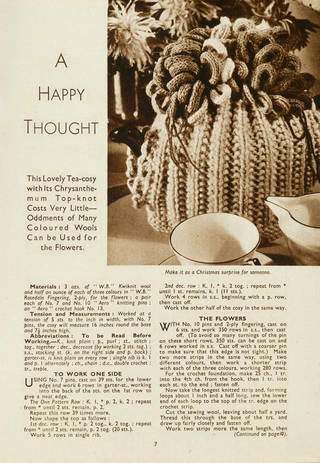 In the face of wool rationing, knitters were encouraged to unravel old sweaters. 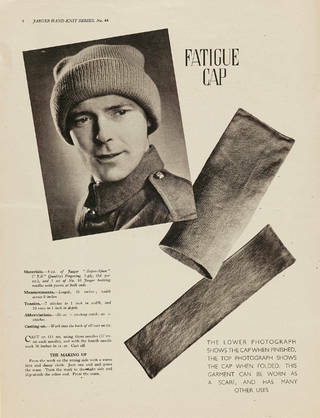 The original 1940s patterns, available to download below, show the wide range of items knitted during the War: a fatigue cap that could double as a scarf, a balaclava helmet and a waistcoat for men, as well as knitted turbans, a When You're 'Off Duty' jumper (its title hinting at the change in women's roles at this time), and gloves for women. 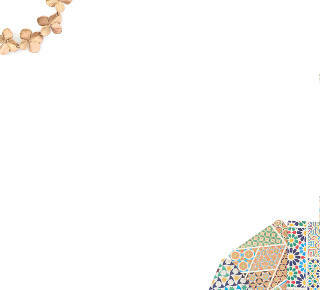 They also show the many specialised patterns developed in response to the specific needs of the time. For example, the gloves have long wristbands for extra warmth, while the balaclava helmet has earflaps "to enable good hearing during telephone calls". 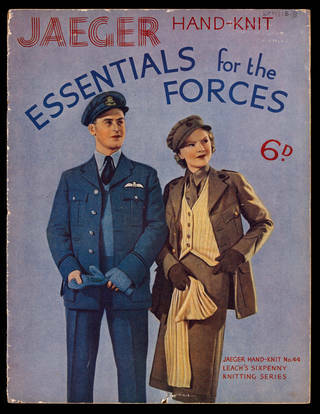 Download the free patterns below to create your own classic 1940s fashion. 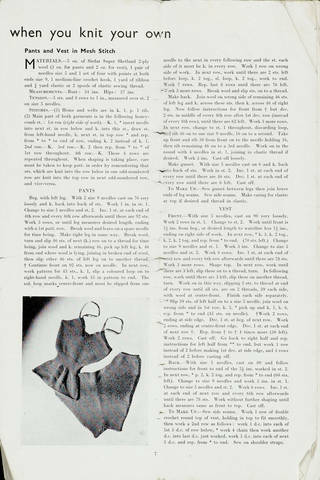 "This garment can be worn as a scarf, and has many other uses". 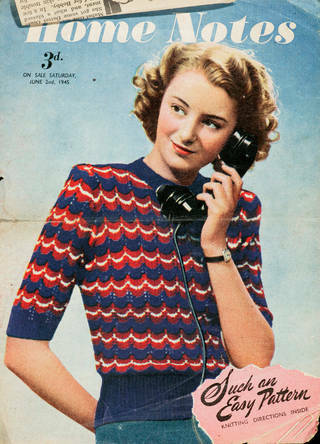 "This design is made with ear flaps to enable good hearing during telephone calls". "One in Moss-Stitch and one with a Bandeau of Stocking-Stitch". 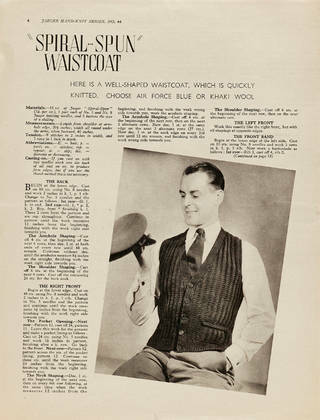 "Here is a well-shaped waistcoat, which is quickly knitted. Choose Air Force blue or khaki wool". 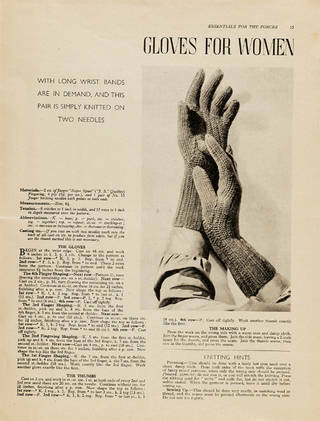 "With long wrist bands are in demand, and this pair is simply knitted on two needles". 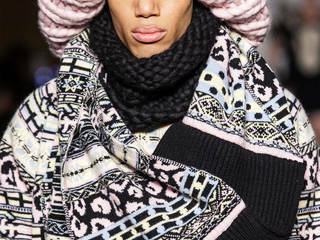 "A Fair Isle pattern is particularly hard wearing as it gives the strength of double knitting". 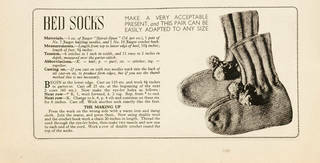 “Make a very acceptable present and this pair can be easily adapted to any size”. 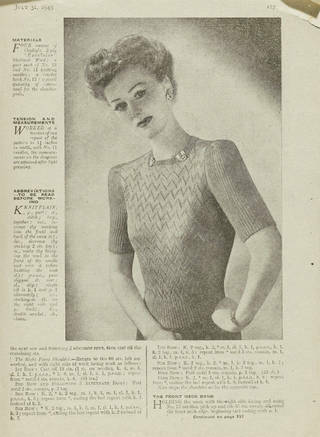 "This jumper is worked in one of the most simple lace-stitch patterns, consisting of two rows, so it is easily learned and quickly worked". 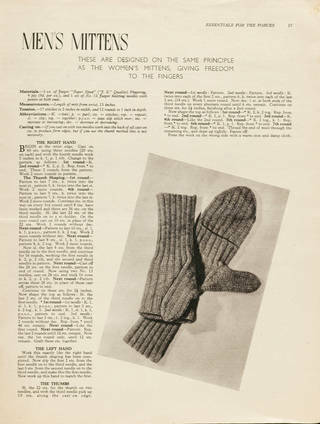 "These are designed on the same principle as the women's mittens, giving freedom to the finger". Gauge: 17 stitches to 2 inches in width, and 12 rounds to 1 inch in depth. "Turn in the tops and the fingers are free, yet keeping the hands warm". "These are Vogue’s choice for town". 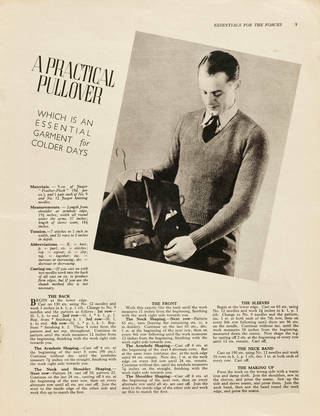 "Which is an essential garment for colder days". "This lovely tea-cosy with its chrysanthemum top-knot costs very little – oddments of many coloured wools can be used for the flowers".